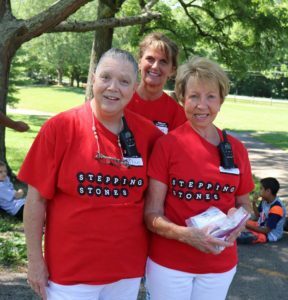 Stepping Stones is a nonprofit, United Way partner agency with four Greater Cincinnati locations. In our year-round programs, LPNs and RNs work closely with individuals with developmental disabilities during weekend camping sessions during the school-year and day and overnight camps in the summer months. Stepping Stones currently has nurse openings for both the first and second shift at our scenic 47-acre Allyn Campus, located in Batavia, Ohio. Our nurse openings are perfect for those who are looking for weekend opportunities during the school-year and part or full-time hours during the summer break. Would You Like to Join Our Nursing Team? To apply for a nursing position at Stepping Stones, please click the ‘Apply Now’ button to complete an online application. Description: Stepping Stones has first and second shift nursing openings. Essential responsibilities include, but are not limited to, medication administration, tube feedings, catheterizations, sub-q injections, first-aid, documentation and organizational skills. Individuals that require nursing assistance may demonstrate any or all of the following characteristics: deficits in social skills and communication skills, challenging behaviors, and/or sensory issues. Nursing candidates should posses a strong work ethic, highly developed communication skills and a history of excellent attendance and punctuality. Experience is preferred, but willing to train the right candidate. An understanding of developmental disabilities is beneficial, but not required. PRN schedules available with day and evening hours, as needed. Requirements: Candidates must have a current LPN or RN license, CPR and First Aid certification, the ability to lift at least 50 pounds and be of at least 21 years of age with an excellent attendance history. Compensation: Compensation commensurate with experience and license.